David Ludwig, owner of Creative Light Productions, has fifteen years of broadcast video credits mostly as Producer, Director, and Editor for PBS television. Mr. Ludwig has many local credits for commercial broadcast, corporate and educational presentations, as well as legal video presentations. 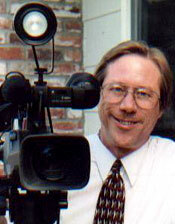 He has received many awards for his videos including six Sadie Awards in 1990, 1992, and 1995. He received the Video Free America Production award for Joy of Ballooning and a national award from CPB Public Television for the music program, Intiillimani in Concert. Mr. Ludwig recently produced a documentary, Pomo Basketweavers, about the Pomo Indians of Northern California which has distributed nationally on PBS television and won the national award for best video documentary at the American Indian Film Festival. Mr. Ludwig has also produced many videos for the for the legal profession (especially video biographies and “day in the life” presentations). In 1993, a Press Democrat article stated that “the video moved the jurors to tears” in the Christina Appleton wrongful death case (B. Weitzenberg, attorney) and that it was “the highest award amount given in a wrongful death civil suit in California history”. Our video services are broadcast quality, and include multi-camera production, computerized editing, computerized graphics, special effects, digital video, tape duplication, photo to video to DVD transfers, scriptwriting, and rough-cut editing. We can take your video project from concept to completion. KRCB-TV (PBS-Rohnert Park), KFTY-TV (Santa Rosa), KPIX-TV (San Francisco), Sonoma State University, National Right to Read Foundation, California Indian Basketweavers Association, Sonoma County Fair, DeMeo & DeMeo, Attorneys, Kreysler & Associates, Gundluch Bunshu Winery, The Medical Network, Disney Productions, American Language Institute, Sonoma Business Magazine, Foster & Gallagher, Santa Rosa City Schools, Santa Rosa Police Dept., Oakland Museum, and many small businesses.